If you're as in love with taking photos using Instagram as I am, then I have the project for you. 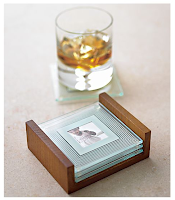 Using Crate&Barrel's 5-piece photo coaster set and your iPhone, snap photos of your favorite cocktails, then print them out to size on photo paper from your home computer. Slide them in between the glass and the little mats and viola! Your own, customized set of artistic coasters. For Instagram tips from top photographers click here and for your printer supplies, click here. Have fun!